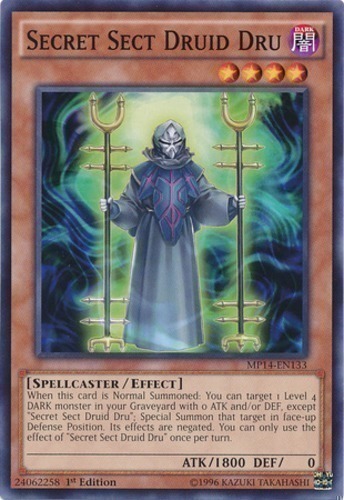 When this card is Normal Summoned: You can target 1 Level 4 DARK monster in your Graveyard with 0 ATK and/or DEF, except "Secret Sect Druid Dru"; Special Summon that target in face-up Defense Position. Its effects are negated. You can only use the effect of "Secret Sect Druid Dru" once per turn.